One perk associated with Flip Video’s FlipShare software is the opportunity to share and store your videos online with Flip Channels. You can use your Flip Channel to give your friends and family members access to folders that contain your Flip videos and pictures. But first, you have to activate your account. 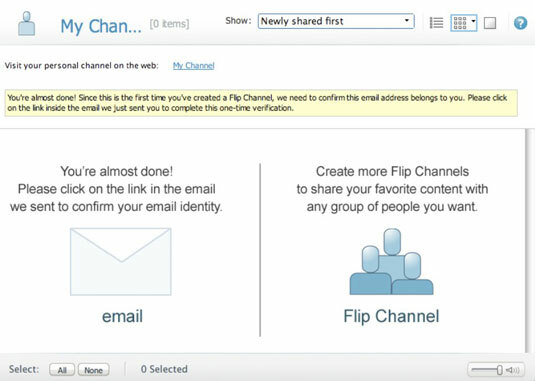 Before you can access your My Channel folder or create new folders to share with others, you must first activate your Flip Channel by providing your name and the e-mail address you’ll use to log in to your Flip Channel. After you supply that information, you then must verify your account by responding to an e-mail you receive to confirm you are the owner of the e-mail address you provided to use as your Flip Channel login name. Make sure that the e-mail address you sign up with doesn’t have a spam filter that auto-deletes e-mail. If the initial sign up e-mail is deleted, activating the account might be difficult. Launch FlipShare (if it isn’t already running) and click My Channel, beneath the Sent Flip Channels item in the Navigation pane. The My Channel registration window appears. Type your name and e-mail address into the appropriate fields, and then click the Create button. The My Channel window displays a message instructing you to click the link in an e-mail that FlipShare sends you to confirm your identity. 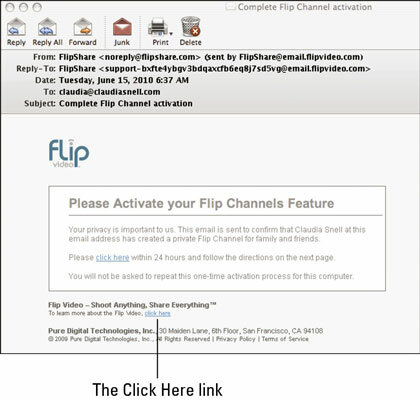 In your e-mail program, open the Flip Channel confirmation e-mail message, as shown below. If you don’t find the message in your inbox, check your Spam or Junk Mail folder in case your e-mail program or service mistakenly identified the message as spam or junk mail. Click the “Click Here” link in the middle of the e-mail message. Your Web browser launches (if it isn’t already running) and opens to the Welcome to FlipShare.com Web page, which displays characters you must type in to verify your Flip Channel account. Click the text field and type in the characters displayed above the text field; then click Enter. A confirmation message appears saying that your Flip Channel has been activated. You can close your Web browser and return to FlipShare if you want.